MONTPELLIER, France (AFP) - The Israeli ambassador has criticised the French government for issuing a death certificate for Palestinian leader Yasser Arafat stating his place of birth as Jerusalem. “I cannot understand how the French government agreed to issue a death certificate based on false information,” ambassador Nissim Zvili told a press conference in Montpellier. The issue is symbolically important because Israel considers Jerusalem as its eternal capital, while Palestinians want to make east Jerusalem, occupied by the Jewish state since 1967, the capital of their promised state. (Ed- this was offered both at Camp David and later in Washington as part of the Clinton parameters). Arafat's claim to have been born in Jerusalem on August 4, 1929 is supported by his recently issued death certificate. However, a birth certificate registered in Cairo, Egypt gives August 24, 1929 as his date of birth, as confirmed by Arafat's biographer Alan Hart and Palestinian biographer, Said K. Aburish. Respected Palestinian editor Abel Atwan reveals why Arafat signed the Oslo accords - in the hope that thousands of Jews would be forced to flee Israel. Atwan also discloses that Arafat formed the Aksa Martyrs Brigades in response to an attempt to marginalise him after the failed Camp David summit in 2000. Atwan points out that Arafat's policy may be realised. 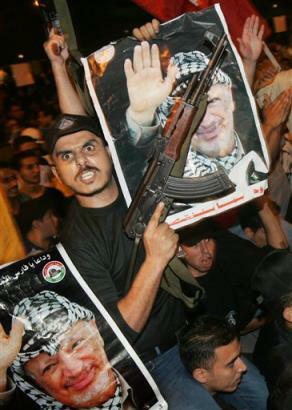 "The Jews did not escape from Palestine by the thousands as President Arafat predicted. But they have started packing their bags to run away from the Gaza Strip and some settlements in the West Bank. There are also signs of emigration to Europe, the US and Canada following the suicide bombings and the sense of insecurity among Israelis." Yes, terror is the selected tactic because it works, it is not selected out of desperation or poverty. It ensures Israeli responses, which the Palestinians leverage to dress themselves as hapless victims, ensuring that they will never be expected to make any compromises at the negotiation table. Yasser Arafat's nephew Nasser Al-Kidwa said Monday that according to medical records released to him by the French Ministry of Defense, there were no traces of known poisons found in the Palestinian leader before he died, but that his cause of death remained a mystery. The "he was poisoned" conspiracy will forever remain entrenched in the hateful delusions of the Arab world, because the reason for his death will never be released. Could this be because he may have died from a not-very-Islamic related disease? James Taranto points out that a Yahoo! News search for "Arafat" suggests "Arafat Aids" as an alternate search. Nasser Al-Kidwa has revealed why Arafat died - "The heart stopped beating, this was the cause". MEMRI's TV Monitor Project has recently released a number of clips related to Yasser Arafat. Here is an excerpt of one such clip. Speaking is the Palestinian ambassador in Iran. "This man knew that this path is the path of martyrdom and Jihad. He knew that this great cause requires martyrs, not leaders, who look after their personal future and not the nation's future. He fought the Jihad and we saw him in many battles. Sometimes he was right and sometimes he erred. And whenever he erred, we would tell him: this is a mistake. And whenever he was right we would praise him. And now he is gone. If you ask me what will surely be the end of this Zionist entity, I will say to you that this entity will disappear one of these days. And its leaders, who can see what will be in the future, understand this. It's a matter of time." He was single-minded, but not about statehood or a real peace. Meanwhile, the Arab world are furiously scratching for a way to blame the terrorists death on Israel, as ArabNews push the poisoning conspiracy theory. Of course, they don't even consider the not-very-Islamic possibilty that he died from HIV/AIDS complications. The Mail & Guardian, the Sunday Times, the City Press et. al. have all gone off the deep end as they drool over the cold blooded, Jew hating monster. My blood pressure can't handle this parade of stories idolising the dead terrorist and so I won't even bother linking to the stories, which all really say the same thing, avoiding all terrorist atrocities that he orchestrated, calling him a great leader and liberator, comparable to Nelson Mandela. Instead, I will post about things that you will not find in the mainstream media. Arafat's biggest moment could have been at Camp David or at Taba in 2000 and 2001 where he was offered amazing concessions in what could have been an historic deal. Arafat refused to end the conflict, and the mainstream media persistently and intentionally avoid this event lest some really factual information smear the name of their "hero". Dennis Ross was the lead lead US negotiator in the presidential administrations of George H.W. Bush and Bill Clinton. He orchestrated Camp David and Taba. No-one is in a better position to comment on the failed deal than Dennis Ross. Here is an interview with Dennis Ross that took place on Fox News in April 2002. Transcripted excerpt from Fox News Sunday, April 21, 2002. First, an excerpt from the interview discussing Arafat, then click on the continue reading link to read the full interview. BARNES: Was Arafat alone in rejecting it? I mean, what about his negotiators? ROSS: It's very clear to me that his negotiators understood this was the best they were ever going to get. They wanted him to accept it. He was not prepared to accept it. Arafat's whole life has been governed by struggle and a cause. Everything he has done as leader of the Palestinians is to always leave his options open, never close a door. He was being asked here, you've got to close the door. For him to end the conflict is to end himself. ROSS: It is possible he concluded that. It is possible he thought he could do and get more with the violence. There's no doubt in my mind that he thought the violence would create pressure on the Israelis and on us and maybe the rest of the world. And I think there's one other factor. You have to understand that Barak was able to reposition Israel internationally. Israel was seen as having demonstrated unmistakably it wanted peace, and the reason it wasn't available, achievable was because Arafat wouldn't accept it. Arafat needed to re-establish the Palestinians as a victim, and unfortunately they are a victim, and we see it now in a terrible way. I recommend to you "Leadership", by Rudi Giuliani, one of the great leaders of our time. Giuliani "gets it", and he truly understood Arafat. Here are some extracts I dug out where he discussed Yasir Arafat. In 1990 the United States felt it had to negotiate with Palestinian Authority President Yasir Arafat - but we needed to require more of him, not less, because he was somebody who wouldn't "stay bribed". He'd be given territory, but wouldn't do what he said he would, and would say he couldn't unless he got more territory. We would make concessions, as would he, we'd live up to ours, he wouldn't live up to his. He would promise to expel or arrest terrorists - then fail to do so. For years I had been saying that we were negotiating with the wrong person. Let me return to my earlier analogy. If you're buying a house and arrive at a price, you expect your new home to be delivered once you've met your side of the bargain. If it turns out that whoever took your money does not represent the seller, you know you've been had. That's what happened time and again with Arafat. We've repeatedly received assurances that he was no longer going to provide haven for terrorists, then discovered that in fact Palestine was a breeding ground for them. There were those in power in the 1990s who, instead of refusing to deal with Arafat, helped promote him for the Nobel Peace prize! The situation had grown eerily similar to the 1930s, when misguided sympathizers refused to see the world for what it was. The list of heads of state who attended Arafat's funeral makes for interesting reading: Jordan's King Abdullah II and the presidents of Syria, Yemen, Algeria, South Africa, Indonesia, Malaysia, and Brazil. Iran only sent its foreign minister. In related news, in what is a mockery to all poverty stricken people in the disputed territories, the PA officials have made an assurance to Suha Arafat, that she will receive $22 Million a year from the PA to cover her expenses in Paris. Meanwhile, Fatah, Hamas, Islamic Jihad and other bloodthirsty groups issued separate leaflets calling on the Palestinians to escalate the struggle.